Our Elementary Spanish Course will help you become familiar with everyday conversations and start to touch on more complex grammar rules of Spanish. This is your last stop before progressing to our Intermediate, B.1 Level courses! Enrol today as spots fill up quickly! Students must be able to demonstrate their knowledge of Spanish at the A.1 Level. Cash and Cashier’s Cheque must be given in person at Spanish Language Institute’s facility. For payments done via Bank Transfer, please email either an electronic or scanned copy of the receipt to: info@sli-praha.cz with your name and desired course enrolment within the email’s subject line. Online Booking can be performed either via PayPal or personal credit/debit card. Simply follow the booking procedures and you will be prompted for either your PayPal or credit/debit card information. Nos enorgullece saber que nuestros profesores proporcionan a cada estudiante no sólo años de experiencia, sino también un nivel incomparable de profesionalidad, conocimientos nativos y lo más importante: amor por la enseñanza. A través de esto, somos capaces de garantizar a cada estudiante una experiencia de aprendizaje excepcional junto con precios competitivos. Begins on 04/09/2018, every Tuesday from 20:40 - 21:40. This course can be purchased at part of our monthly package for 760 czk (190 czk / hour). Begins on 21/08/17, every Monday from 15:00 - 18:00. 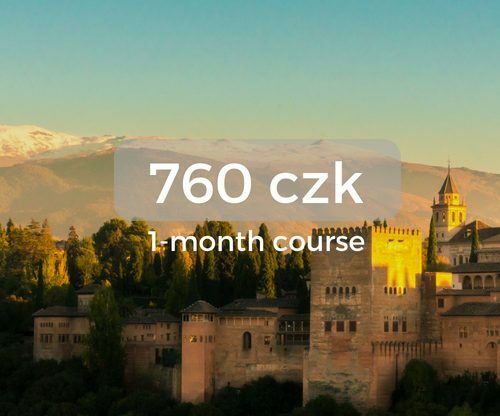 This course can be purchased as part of our five-month Full-Immersion Package for 9.720 czk (162 czk/hour). Begins on 29/07/17, every Saturday and Sunday from 12:00 - 15:00. 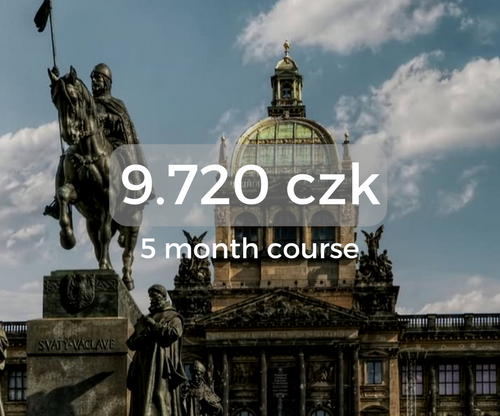 This course is offered as a 2,5 package for 8.100 czk (135 czk/hour). © Copyright 2019 SPANISH LANGUAGE INSTITUTE s.r.o.